Pepsi Next is releasing a Super Bowl campaign video this morning and pushing it with YouTube and BuzzFeed ads to create buzz during a day when big-game chatter could seem like a wall of noise. 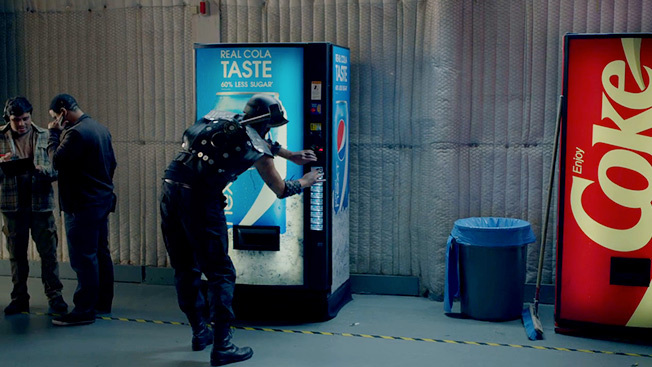 The 1-minute, 15-second video, dubbed "Vending Machine," is the latest item from the beverage brand's ongoing partnership with digital comedy player Funny or Die. It's been a week of Super Bowl build-up for Pepsi Next, which debuted in March 2012 as a mid-calorie, low-sugar alternative to Pepsi and Diet Pepsi, as well as rivals Coke and Diet Coke. On Jan. 28, Pepsi Next and Funny or Die released a 1-minute, 50-second video teaser called "Shopping." The next day, they put out a long-form version of Pepsi Next's "Party" ad, which will air as a 30-second spot during Super Bowl XLVII. Pepsi Next also launched a "Pin to Win" Pinterest contest on its Facebook page for the big game. Though digital interest around the brand will likely peak after its first-quarter commercial during this evening's CBS broadcast. The spot will promote the opportunity for consumers to visit PepsiNext.com to get a free 2-liter bottle of the soda. The first 1 million people to fill out the form will garner the gratis drink. TBWA/Chiat/Day led creative for the ad, including the tagline, "Drink It to Believe It." One can imagine the emailed coupons that might follow the give-away effort, underscoring how some Super Bowl advertisers this year seemingly have more of a direct-marketing mindset than usual. All in all, today is a huge one for PepsiCo, which has seen its flagship Pepsi brand fall to third place for soda sales behind Diet Coke (second place) and Coke (first) in recent years. The Purchase, N.Y.-based company can only hope Beyoncé wows the some 100 million TV viewers who watch her halftime performance, sponsored by Pepsi. Seven weeks ago, Beyoncé and Pepsi inked a multiple-year endorsement deal estimated at $50 million, while naming the songstress as global brand ambassador.